Fake news has been a hot topic since news media were invented. The main differences between fake news and normal news or false reports are the specific unrevealed intention of the news, fabrication or abuse of a fact, and no accuracy of news. Fake news always has an intended message of a hidden wire-puller. Many other countries are concerned about this matter. Germany is one of the representative countries which protect the public opinion from the distorted truth by regulation. Although huge global concerns exist on this matter, there has not been any facility to distinguish fake news in South Korea and it is also hard to collect statistics of fake news. The Korean government is trying to set up measures in order to clamp down on fake news only now. I disagree with the idea that the government regulation can suppress free expression and cause a totalitarian atmosphere. First of all, uncontrollable fake news rather can induce a totalitarian situation. The biggest stage of fake news is social media, which has a fast and powerful network to spread their message. If some incendiary fake news encroaches the space for a purpose, it could be treated as fact before the truth raises its voice. That is the situation that freedom of expression is indirectly limited. There is an interesting experiment of Solomon Asch which tested the effect of social pressure from a majority group of conformity to a person. In the experiment, among the seven or nine participants (consisting of male college students) only one participant was the real subject. The investigators suggested three lines with different lengths, and they were told to guess which line was the longest. Surprisingly, the result shows that 76.4% of the subjects chose the wrong answer at least once when the other participants’ answers were obviously wrong. A similar case can be found in history. There is a case that media is first used to instigate the public. Joseph Goebbels, a famous Nazi, the one who was in charge of propaganda, supplied radios to the public which broadcasted ideas of Nazism all day. He made a big contribution to its proliferation. Looking at his one phrase “If you tell a lie big enough and keep repeating it, people will eventually come to believe it,” we can strongly be certain that fake news is dangerous. The mere exposure effect is the notion explaining the same phenomenon. The effectiveness of repeating. Even though Goebbels's news was by the government and the fake news of today is by other bodies, the above instances are still valid to know how it's risky to be exposed to fake news. The Korean measurements offer the minimum filter system. Secondly, freedom of making fake news and freedom of expression should be considered separately. On Wikipedia, it shows the definition of freedom of expression as "a principle that supports the freedom of an individual or a community to articulate their opinions and ideas without fear of retaliation, censorship, or sanction". When we look at the background why the freedom is recognized as human rights, it was to save people's body or mind from persecution which occurs because of their free thoughts, opinions, and ideas. On the contrary, making fake news is not about sharing ideas or conflict of opinions for human development. It is only for the makers' selfish goal with an unacceptable bad manner that can damage someone on all occasions. Plus, fake news also conflicts over the justification of the role or the existence of the press. The press must take account of its influence on the public and maintain justice and fairness though they hold some purpose. Especially for the news, double fact checking is essential. That is why broadcast stations apologize when they air false news, to keep people from erroneous information. There is an opinion that netizens can figure out what is fake news and what is real. However, it is nonsense to make people worry about misinformation while reading the news and try to figure out every whole fact. Thirdly, fake news can impair freedom of thought which takes the premise of freedom of expression. For example, in Korea, the press named Dispatch usually gives the first news about celebrities. Regardless of its correctness, a popular fresh celebrity's huge scandal takes an enormous interest, and the public starts to reproduce the information with their opinions and reinforce thoughts by interacting with others. After a week, going by a difficult process of checking facts, even though it turns out to be untrue, the toughened image of the celebrity still remains for quite a long time. There is a related psychological notion for an explanation. The mere exposure effect again, and the primacy effect. The primacy effect, which emphasizes the importance of the first impression, says that first given information largely affects an evaluation of an object. Again, Asch comes out. In another experiment of his, he suggested lists of characteristic words with two sorts of sequence, positive-first or negative-first. People who got the negative-first list estimated the object more negatively than people who got the positive-first list. In this context, fake news exerts a huge influence on the public by repeating and getting ahead of other news and achieves what it aimed by its very existence. Bringing up the feature of fake news again, we can easily expect that people's thoughts on an issue can be disturbed and manipulated by a wire-puller and lose the right to think and express the thought freely. In conclusion, the South Korean government makes an effort to apply measurements to regulate fake news in the cause of not only justice but also liberty. The uncontrolled misinformation of fake news can inhibit the full freedom of expression and thoughts, and it can lead the nation to be swayed by fake news. Therefore, I disagree with the idea that regulation on fake news gives rise to the suggested matters. In this era of information, in the tides of information, we also have the freedom of getting innocent news. When I got the phone call letting me know that I have got the first prize, I couldn't believe it. It was surprising news, but not fake. I feel honored and happy to get this big prize of the 2018 English Essay Contest. I have had an unforgettable experience and memory before I wrap up this year. 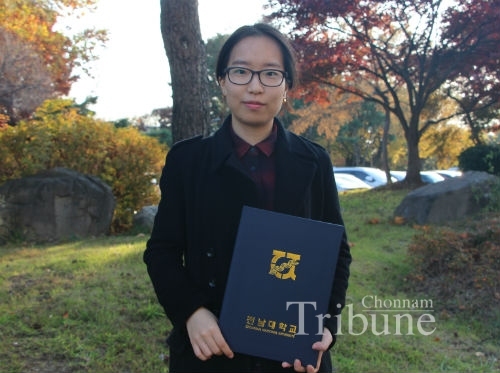 I am grateful to the Chonnam Tribune for this opportunity to organize thoughts about the social issue on fake news which emerged as an important issue. It will be a meaningful leap for myself. Thanks for the support of my loving family and friends, I got over my hesitation about whether I should participate or not, and the challenge became a wonderful present. They were as excited as I was with the unexpected result. I am still overwhelmed but humbled, too. I would like to accept this prize as an encouragement to study English writing further, and to be concerned about society. The topic of the Essay Contest implies that the ability of independent thinking is important. It shows practice establishing one's own idea on a controversial issue and this is a crucial point of education. However, I am sure it is not easy to be a free thinker, and I too was one of those who encountered many difficulties while writing this essay. I spent almost half of the given time to build my ideas. When I look back at the four hours of this contest, I can only remember writing something hard and I did my best. 1000 words were a lot, even though the topic was one of my matter of interest. I constantly checked the clock and could turn in the essay narrowly within the time limit. It was quite challenging. By taking part in this essay contest, I learned the meaning of courage, challenge, and will. I felt a sense of accomplishment. Next year, I get started on the next course of my B.S./D.D.S. program. I hope I can recall this pleasure while I am in the middle of the storm of my study. Again, I appreciate this huge honor. I will regard the chance as a stepping stone to make up for the things that I lack and to make an effort towards greater growth.